Types of Thermostats –Which Type is The Best For You? When installing the heating system at home, first of all, we want comfort. And we have in mind not only the temperature, allowable pressure but also automated control of these and other processes. Therefore, modern heating systems are equipped with the control unit, thermostat. In turn, it is intended to fulfill all the necessary commands and also save energy. But what to do if the thermostat is broken? I’ve been in such situation. I’ve studied the information about these control units. That’s why I’ve created this website so that you do not have to repeat my way. Nowadays, on the market of heating equipment, there is a wide range of thermostats and it is very toilless to get confused when it comes to the choice. In this article, I would like to cover all of the main types of thermostats to help you to solve the problem of choosing the right device for your heating system. Typically, line-voltage thermostats are applied to regulate convection or resistance heaters mainly with the voltage of 240V as well as such systems as baseboards or radiant. 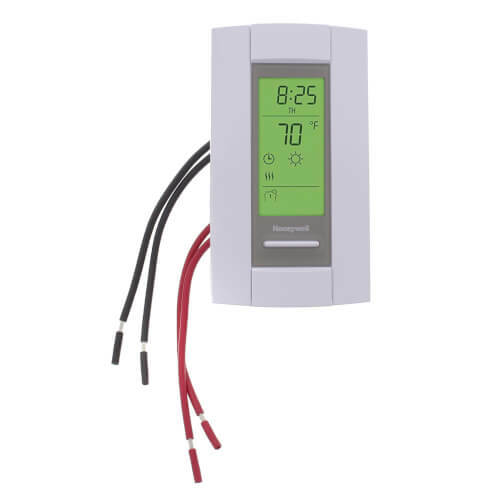 Line-voltage thermostats are easily identified as they have thick wires, usually 2 or 4. The current passes through both the control unit and the heating equipment. In this case, the line-voltage thermostat is switched off when reaching the preset temperature, even if the heater didn’t warm up the room to the preset temperature. we suggest the Lux Products ELV4 Programmable Line Voltage thermostat. A more efficient solution for electric current control is exactly the low-voltage thermostats, which in turn are used to control central heating systems. Moreover, the systems can use either or gas, or electricity, or even oil. In our country, they are popular to regulate the temperature of water heaters, air conditioning, heat pumps, and etc. 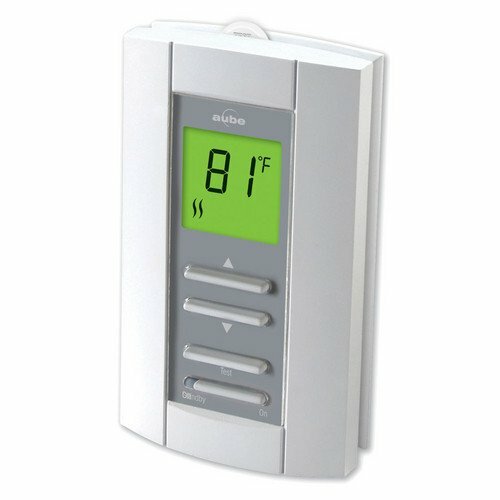 This type of thermostats uses voltage between 24V and 50V, which makes it possible to regulate the electric current and use programmable controls. If you need a low-voltage thermostat, you can click here. If you have to choose between line-voltage and low-voltage thermostats, I recommend reading this article, which will help to easily identify the right device for you. 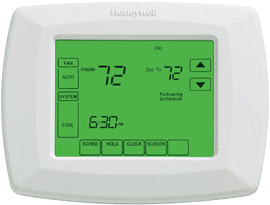 There are a huge variety of thermostats on the market. And despite the rapidly developing technology, we still have non-programmable electronic thermostats. They are designed to keep the temperature at the same level until the user does not change it manually at some time. Of course, the non-programmable models are also developing and now they have LED display. The thermostat shows the set temperature and has buttons to change it up and down or switch on and off completely. This is a great option for those who have nothing against waiting when the house heats or cools after choosing a temperature. Honeywell Focuspro 5000 is a great representative of this group as it is easy to operate and has a rational price and you can read my review here. Programmable thermostats change the temperature in accordance with a previously installed program and the indoor temperature is increased or decreased depending on the time of day and day of the week. A programmable thermostat is an excellent option for users, who would like to adjust the program in accordance with their lifestyle. Programmable thermostats have many designs and a lot of additional options. I’ve seen even options that allow setting 4 different temperature regimes for 24 hours. You can read my review of best programmable thermostat under $100. Nowadays, touchscreen technology is used everywhere. Thus, no surprise that it is also applied to the control units of heating systems. They have been designed for the convenience of users, as you don’t need to study thick manual to find out all of the settings. It can be easily done with the help of the touch screen. With this type of thermostats, you can customize a variety of modes, which allows achieving optimal correspondence between comfort and energy saving. The market offers a wide range of models, but you still should be careful with choosing the best option for your heating system. For example, there are models with complex interfaces, which are designed for controlling the temperature in large premises. If you are seeking for a good combination of quality and price, I recommend you to have a look at Honeywell RTH9580WF, my review of which you can read here. Choosing a wireless thermostat, you can forget about the need for cable laying or even redevelopment. And you can easily upgrade the existing heating system. This greatly improves the mobility in the management of the heater, increasing the comfort of the control and regulation of the room thermostat. The innovative wireless heating thermostat allows you to accurately set a comfortable temperature. It saves electricity and can operate over a wide temperature range. The main disadvantage of these models is a little bit higher price tag. But such device will help to save money depending on the set parameters. You can be sure that when you’re coming back home, your apartment or house will have the temperature that you’ve set previously. A wide range of wireless control units allows you to choose and buy a more inexpensive thermostat with limited functionality or a more advanced one. Here you can read more detailed information about the advantages of wireless devices. I can assume that many of you haven’t heard about this type of thermostats. To be honest, I haven’t heard about them too, until there was a need to choose a thermostat for my home. It turns out that it’s a very helpful device, especially when you are the owner of any portable heating system. Outlet thermostats are as easy to use as the ordinary programmable devices. That’s an ideal solution for the owners of small apartments or houses. It is greatly compatible with a portable air conditioner or heater. Usually, outlet thermostats have displays for better control. The main advantages of these electronic controllers are the precision regulation of the desired temperature; the simplicity of installation and management; and reliability. I’ve made a review of the Lux device, which I think is a good example of an outlet thermostat.